DO I NEED PLANNING PERMISSION FOR FLATS AND MAISONETTES? The planning regulations for flats and maisonettes are more restrictive than for houses. For example, permitted development rights, which normally allow a home-owner to create additional living space without planning permission, do not apply to flats and maisonettes. This mean that planning permission is required for most exterior alterations to a flat such as extensions, loft conversions, outbuildings and in many instances even walls, fences and patios will require planning permission. 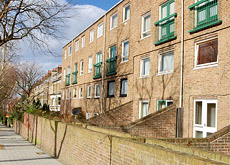 Many homeowners are not aware of the unique planning regulations that apply to flats and begin work assuming that it is within their rights, only to be caught up in an enforcement battle with the local authority. Don't fall into this trap and do things right from the onset. Get the planning permission you require without any headaches or stress. If you would like to convert a house or single flat to several flats or studios you must obtain planning permission. If the property is a listed building you may need listed building consent. We strongly recommend you consult with your local planning authority before you start any work. Carrying out any works to a listed building that affect its special historic character without the required consent is a criminal offence. Drawing and Planning have successfully attained planning permission for many of our clients seeking to convert a house to flats or studios. Contact us today to find out how we can help you obtain Planning Permission. If you would like to add an extension to your ground floor flat you must obtain planning permission. If your flat is a listed building, you may need listed building consent. We strongly recommend you consult with your local planning authority before you start any work. Works to a listed building that affect its special historic character without consent is a criminal offence. Drawing and Planning have successfully attained planning permission for many of our clients seeking to build an extension to a ground floor flat. If you are only proposing to carry out internal works you may not require planning permission. However, local authorities have differing interpretations of "internal works". We urge you to check with your local authority before carrying out any works. If you want to extend or alter the roof space you will require planning permission. It is very important to check whether you own the roof space which you wish to convert. If you are a leaseholder, you may need to get permission from your landlord, freeholder, or management company. If your flat is a listed building you may need listed building consent. We strongly recommend you consult with your local planning authority before you start any work. Carrying out any works to a listed building that affect its special historic character without the required consent is a criminal offence. Drawing and Planning have successfully attained Planning permission for many of our clients seeking to convert their loft space. Drawing and Planning have successfully attained planning permission for many of our clients seeking to convert a space above a shop into a flat. As you may now know, the planning regime for flats and maisonettes differs in many ways to that which covers houses. If you are looking to fit new windows or doors, such as double-glazing or patio doors, in your flat or maisonette, you may require planning permission. You will not need planning permission to add internal secondary glazing. If you are fitting windows which are identical, like-with-like replacements, you should not need planning permission. However, if the new windows differ in appearance or size to those you are replacing (for instance, different glazing patterns), you may need to apply for planning permission. Please note: as interpretation of the rules covering changing windows and doors in flats varies from council to council, we urge you to check with your local authority prior to replacing any windows or doors. It is never pleasant to be served a notice which forces you to remove your new windows or doors. If your flat is in a conservation area and your proposals involve an element of demolition then you may need to apply for conservation area consent. Drawing and Planning have successfully attained planning permission for many of our clients seeking to change windows or doors in a flat. You will not need to apply for planning permission to paint or maintain the external walls of your flat or maisonette. However, in some areas these rights have been removed (by way of what is known as an Article 4 direction). Drawing and Planning have successfully attained Planning permission for many of our clients seeking to make changes to a flat or maisonette. You will need to obtain planning permissions for flats and maisonettes if you will be subdividing a house so that it contains multiple units, or adding an extension to the flat. If the area that will be going through construction is listed, then you will likely need to get consent from the planning authority before any external changes can be made to the area. According to the building regulations, conversions of properties will require you to get approval. You may also need to consult the fire services for any issues regarding setting up fire escapes in your construction project. Do I need planning permission for flats and maisonettes that are only getting internal work performed on them? The answer to this question is no. If the area is having an internal conversion done that will not affect its outer integrity, then you will not need to obtain planning permission for your internal project. Permissions will be needed if you are going to have to alter the roof space of the existing residence to convert the flats and maisonettes. The planning permission requirements for flats and maisonettes differ from the permissions that must be obtained for homes. Even little alterations such as changing out windows and doors may require you to get permission before they can be carried out.